Web performance engineer @ Google. 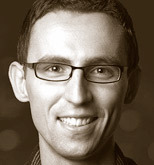 Ilya Grigorik is a web performance engineer at Google, co-chair of the W3C Web Performance Working group, and author of High Performance Browser Networking (O'Reilly) book. In short, an internet plumber. Join web performance experts Ilya Grigorik and Suzanne Aldrich as they discuss how the evolution of modern web protocols challenges common wisdom when building fast, scalable, and secure Web applications. In this session, we will discuss our experience in using BigQuery, how we modeled the GitHub event data, and the lessons learned in importing and making the data available.